Anne Oliver is a Coldwell Banker Global Luxury broker with 24 years of experience representing buyers and sellers on Oahu, and specializing in the representation of oceanfront and luxury properties island-wide. She was the Top Producer of Coldwell Banker Pacific Properties among 600 plus Agents and Brokers for 2013, and was awarded NRT’s prestigious Society of Excellence award in recognition of her sales success achieved in 2013 and again in 2018. Anne represented the highest sale on Oahu in 2018, and is in the Top 1% of all Coldwell Banker Sales Associates in the United States. 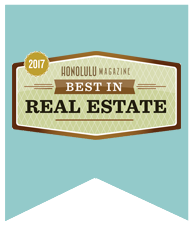 Consistently a Top Producer at Coldwell Banker, Anne has been ranked by Hawaii Business Magazine as a Top 100 Realtor year after year. A top performer with a wealth of experience, market savvy, and strong negotiating skills, Anne’s commitment to her clients, while maintaining confidentiality of their interests, has guided her successful representation of her clients throughout her career.